This post features two snap previews from the slate of second round matches set for Thursday at the 2017 French Open including Daria Kasatkina vs. Marketa Vondrousova and Agnieszka Radwanska vs. Alison Van Uytvanck. For a recap of day 3 action at the French Open, check out the latest Set Points round-up on Moo’s Tennis Blog HERE. Excited for this one… the number 26 seed, Daria Kasatkina takes on the surging Czech qualifier, Marketa Vondrousova in the second round. 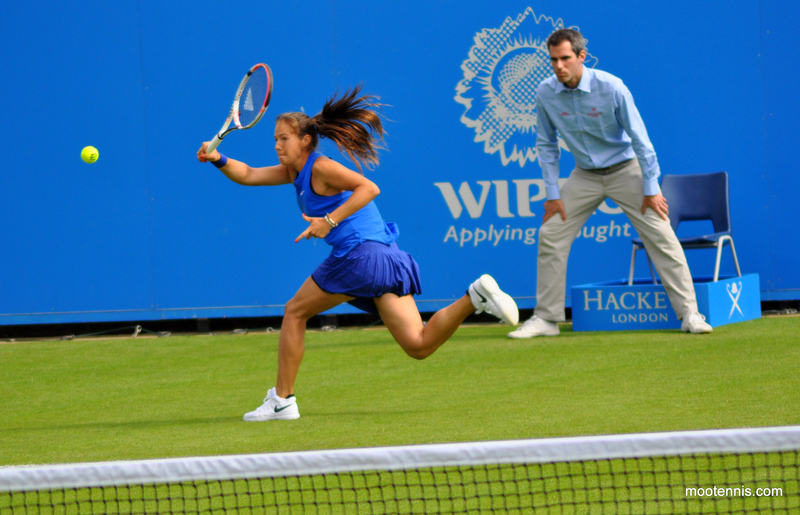 Kasatkina played her first match on Tuesday since injuring her ankle in Rome. The Russian player had it heavily taped but looked quite secure in her movement in a 7-5 6-4 first round win over Yanina Wickmayer. Kasatkina failed to serve out the first set at *5-4 but took her chance second time round on a beautifully constructed set point. Wickmayer had given Kasatkina the chance to serve for the set again with some erratic play. Kasatkina was mostly on the defence in this match but showed some gorgeous touches in the second set and held it together to serve out a big win, a first one since Charleston. Vondrousova won her 42nd (!) match of the year on Tuesday and her fourth at Roland Garros for the loss of just eight games, beating Amandine Hesse, 6-1 6-0. The set point in the first set was a classic example of Vondrousova’s patience as she worked the point beautifully before cracking a forehand winner down-the-line. There wasn’t anything particularly flashy, apart from the set point winner in the first set, but Vondrousova’s ability to build the point was key as she increasingly forced the error from Hesse. The Czech player was solid in defence and always looked in control of her game and emotions. Final thoughts: Vondrousova has been flying through her matches at Roland Garros but should encounter some resistance from a clay-loving, Kasatkina. As impressive as Vondrousova has been, Kasatkina is the first top 100 player she will play in Paris. This will be a firm test of the ankle for Kasatkina and as goes with the Russian player, she’ll likely need to step up the aggression and variety, and stay closer to the baseline to get past an in-form Vondrousova. Heart says Dasha, head says Marketa! Former Roland Garros quarter-finalists, Agnieszka Radwanska and Alison Van Uytvanck will square off in the second round of the French Open on Thursday. Radwanska missed Madrid and Rome due to a foot injury and returned to action in Paris with a 6-1 6-1 first round victory over Fiona Ferro. While Ferro is ranked at #201 in the world and made a lot of unforced errors, it was a very encouraging performance from Radwanska, who looked more her normal self on court – the Polish player had looked lacklustre (perhaps injury affected?) for much of the year but on this occasion, played with more intent and made many convincing ventures to the net. Van Uytvanck won her first main draw WTA level match of 2017 and her first Slam match in two years with a high-quality display to beat Naomi Osaka, 6-3 7-5. Granted, Osaka has not found her game on this surface and she hasn’t won since qualifying in Stuttgart, but Van Uytvanck didn’t let her play, producing an aggressive display with superb depth on her groundstrokes. Van Uytvanck’s serving stats were much better than Osaka and the Belgian player dropped just 11 point behind her first serve. Van Uytvanck has been blighted by injury having had surgery on her ankle and wrist in 2016. At this moment in time, Van Uytvanck appears to be healthy and thriving on the clay. Head-to-head record: Radwanska leads Van Uytvanck, 2-0 in their head-to-head with wins in Brussels (6-2 6-1 on clay in 2012) and Fed Cup action (6-2 6-4 on hard in 2013). Final thoughts: Before Radwanska took to the court I would have given the edge to Van Uytvanck in this clash. There were several moments in Van Uytvanck’s first round match where Osaka could have got back in contention but the Belgian player slammed the door shut with intent. Radwanska looked solid on Tuesday but this will be a much tougher match. Still early days… perhaps skipping Madrid and Rome to rest the foot injury may have been key for Radwanska in resetting her year. May 31, 2017 in Kasatkina, Radwanska, Roland Garros, Snap Previews, Van Uytvanck, Vondrousova, WTA. My pick Bertens defeated by Bellis 6-3,7-6. Bertens power could not beat Bellis consistency and placement of shots. Bellis will probably meet Wozniacki in another good match in the next round. A bit surprised at that, thought Bertens was a good shout. First set of Muguruza-Kontaveit was great and sounds like it just got better and better! In my opinion Radwanska was nothing close to her normal self. I didnt see any conviction in her shot making which used to be her forte. Van Uytvanck wont be easy. Agree that Van Uytvanck won’t be easy. I thought that Radwanska was more positive than most of her matches this year. I actually still dont get Kasatkina. We all know she is talented and etc. but she is so passive through her matches. Aga is defending all the time but she has no power, Kasatkina has everything she needs to play with more agression, she knows she must and still nothing. I think Vondrousova if she stays still, she will find her winners. 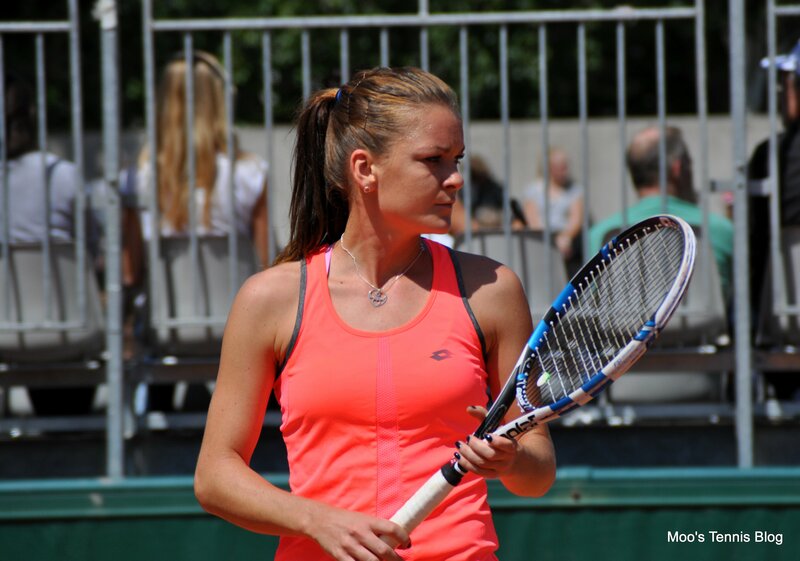 And to Aga, I have to say that she is ready to leave the tournament in my eyes but it is hard to see Van Uytvanck. On the other hand if she is able to win, it is in Paris I think. Aga is quite lucky, because in the next round she could meet Strycova that is just not able to beat Aga anyhow..
I’d cut Kasatkina some slack based on her first match at RG since I guess she was unsure of her ankle. But yes, it would be nice to see her be more aggressive on a consistent basis but I think it will come with time and confidence. This is still only Kasatkina’s second full year on tour.